CompuCell is an open source software modeling environment and pde solver. It is largely used for cellular modeling (foams, tissues, etc. ), however, efforts are being made to include fluid simulation capabilities. Created in collaboration between groups at IU and Notre Dame, CompuCell provides an easy user interface for complex cellular modeling. We have conducted a preliminary integration of CompuCell3D with Systems Biology Workbench (SBW) to link to subcellular models. As a result users can select the level of detail in their models while working within a single integrated framework. Python comes pre-installed on Mac OS X, but due to Apple’s release cycle, it’s often one or even two years old. The overwhelming recommendation of the « MacPython » community is to upgrade your Python by downloading and installing a newer version from the Python standard release page. 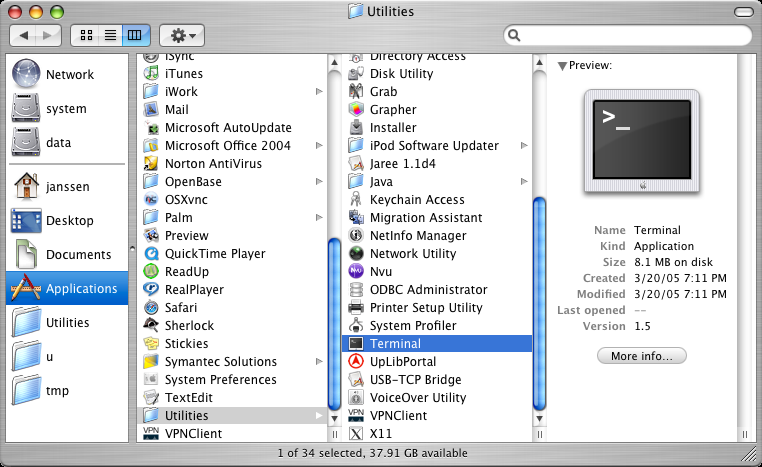 If you are using Mac OS X 10.5, see the Leopard wiki page for detailed information. You don’t have to download anything. You can run a Python interpreter by double-clicking on Applications / Utilities / Terminal (here’s a picture), then typing « python » into the window that opens up. You’ve just evaluated your first Python expression. It’s a simple environment, but good enough to work through the Python tutorial.By the way, if you download the recommended upgrade mentioned at the top of this page, the « IDLE » development environment will make working through the tutorial a bit easier. If the functions a, b f, gD and gN are given, then a numerical approximation is computed, using the method of finite elements. To generate meshes the programm EasyMesh can be used. defining algorithm for the creation of 3D surface meshes. because their local filter neighborhood does not encompass the width of the terrace. away crucial fine details as well as mesh generation artifacts. This class of Surface Reconstruction methods is OK for immerged SURFACE and only for SURFACE. Getting your CAD geometries ready for FEA modeling is easier than ever with the CAD Import Module. It facilitates the reading of industry-standard formats such as STEP, IGES, ACIS® (SAT®) or Parasolid®. Extra add-ons support file formats for packages that have their own geometry kernel. The CAD Import Module goes beyond just the reading of file formats. The interactive repair feature assures that imported geometries are mathematically correct for FEA modeling. And, in order to cut down on unnecessary details in your CAD geometries, defeaturing tools that remove fillets, small faces, sliver faces, as well as spikes or short edges are included. The CAD Import Module also provides a bidirectional interface to SolidWorks® that maintains associativity with the CAD system. This means that parameters can be changed in COMSOL models, which result in automatically updating the CAD geometry in SolidWorks that then updates the COMSOL geometry for a new model. ¹ GDS Import requires COMSOL Script. ² Only import of parts is supported. The system is heavily based on the VCG library developed at the Visual Computing Lab of ISTI – CNR, for all the core mesh processing tasks and it is available for Windows, Linux (src) and MacOSX (intel only). The MeshLab system started in late 2005 as a part of the FGT course of the Computer Science department of University of Pisa and most of the code (~15k lines) of the first versions was written by a handful of willing students. The following years FGT students have continued to work to this project implementing more and more features. The proud MeshLab developers are listed below. Post a couple of lines in the users’ forum describing the project where MeshLab was used. Adopted License, acknowlegments and other legal issues are detailed here. MeshLab is an open source Windows and Linux application for visualizing, processing and converting three dimensional meshes to or from the STL file format. MeshLab, started in late 2005, is a free and open-source general-purpose mesh processing software program; the system is aimed to help the processing of the typical not-so-small unstructured models that arise in the pipeline of processing of the data coming from 3D scanning. MeshLab is oriented to the management and processing of unstructured large meshes and provides a set of tools for editing, cleaning, healing, inspecting, rendering and converting these kinds of meshes. The automatic mesh cleaning filters includes removal of duplicated, unreferenced vertices, non manifold edges and null faces. Remeshing tools support high quality simplification based on quadric error measure, various kinds of subdivision surfaces and two surface reconstruction algorithms from point clouds based on the ball pivoting technique and on the Poisson surface reconstruction approach. For the removal of noise, usually present in acquired surfaces, MeshLab supports various kinds of smoothing filters and tools for curvature analysis and visualization. MeshLab also includes an interactive direct paint-on-mesh system that allows to interactively change the color of a mesh, to define selections and to directly smooth out noise and small features. Version 1.1.0 also includes a tool for the registration of multiple range maps based on the Iterative Closest Point algorithm. MeshLab is available for most platforms, including Windows, Linux and Mac OS X intel only. The system support input/output in the following formats: PLY, STL, OFF, OBJ, 3DS and COLLADA. Art of Illusion requires Mac OS X 10.4 or later with all software updates installed. Download the Art of Illusion installer. Double-click it to mount the disk image, then copy the « Art of Illusion » folder to your Applications folder. To launch the program, double-click the Art of Illusion icon. RepRap is an OpenSource project that uses STL file input and generates solid objects as output. On peut utiliser des parties de ce projet pour la gestion et modif des STL. Freesteel with a web-interface where you can upload an STL file and render it into an image in your browser. ADMesh is a GPLed text-based program for processing triangulated solid meshes, and reads and writes the STL file format. remarque: Mathematica sait lire du STL. *Optional add on for SolidView/Pro. Click here for pricing. There are many other file formats capable of encoding triangles available, such as VRML, DXF, but they have the disadvantage that it’s possible to put things other than triangles into it, and thus produce something ambiguous or unusable.